Drawn and Quarterly has in less than 20 years become an important comics publisher not just for the excellence of some of its books -- as a primary publisher for cartoonists like Chester Brown, Seth and Julie Doucet they have plenty of those in the catalog -- but because the company was the most successful of the second generation of alternative comics publishers that modeled themselves less like comic book companies and more like boutique book publishing outfits. Drawn and Quarterly has also influenced the arts comics end of the funnybook market by having a general same-name anthology during several years of its existence, following the model of keeping a longterm, nurturing relationship with its talent, and by offering books with a certain feel that kind of sold the company to readers even before the individual talents began to demand our attention with each individual effort. With a growing staff, a locked-in business model and more books than ever, Chris Oliveros' comics company seems to be in a pretty good place, all things considering. I called and spoke to Chris Oliveros on my second day working in comics, and found him polite and helpful. That hasn't changed. I appreciate him taking this time. TOM SPURGEON: Chris, can you give us a kind of state of D+Q at this moment in time? It seems like you've had your current team and distribution situation in place long enough to maybe have an idea how things are going to operate for the conceivable future. CHRIS OLIVEROS: We just put the last distribution mechanism in place this past summer with the addition of our new U.K. distributor, Publishers Group U.K. And for the first time in five years, I can say I'm very satisfied with all of our distributors from FSG in the U.S. down to Tony Shenton (our sales rep for the direct market). Our publishing output in the last couple of years has been the most ever in D+Q's history, and we will continue to gradually add more books. We'll do so carefully, however, as it is imperative that we stay small and focused in order to maintain the very high standards that readers and stores have come to expect from D+Q for the past 17 years. SPURGEON: Can you talk about what having Peggy Burns there with the company has meant to D&Q and what led you to decide to re-up your contact with her? Does it make a difference in how you approach publishing generally? OLIVEROS: When Peggy came on board, D+Q was in throes of having to decide whether to get its second new distributor in three years. She was an important factor in finding our new distributors and for the growth of D+Q the past few years with obviously publicity and behind the scenes day-to-day tasks. And of course, with Peggy comes Tom Devlin, who as an editor and designer at D+Q, and whose vision and design sense I respected before he came on board with everything he did at Highwater, is invaluable. We now have three other employees, Jamie Quail, our studio coordinator, Rebecca Rosen, our production coordinator, and Jamie Salomon, our esteemed number cruncher. I'm grateful for everything these five people have done for D+Q. In addition to expanding our staff, we also started to outsource two time-consuming tasks that have also helped to improve our bottom line. We hired Tony Shenton as our sales reps to comic shops, and he has made a tremendous difference in getting new accounts. We also hired a foreign rights rep, Samantha Haywood, to not only negotiate the daily offers we receive from comic companies around the world, but to pitch our books to companies large and small. She has done an excellent job for us. I think we may be the only independent North American comic book company who actively seeks and signs deals with companies like Jonathan Cape, Seuil and Faber & Faber. SPURGEON: The jacketless hardcovers you've been releasing are very attractive; can I ask how the decision to do most of the books released this year that way was made, and maybe how design decisions are made generally at D+Q? OLIVEROS: Most of the design decisions are made by each respective cartoonist. If the cartoonist isn't a designer, Tom and I discuss the design issue with him or her to try to come up with something that will be both bold and unique as well as complimentary to the work in question. For example, Miriam Katin didn't design her book, but she had a strong sense of how she wanted it to look. Tom (the designer on her book) went back and forth with her and finally captured what she wanted. Jacketless vs Jacket is never really a discussion, the process is much more organic, which is why some have it like Guy Delisle's books and some do not. SPURGEON: Is there any reason why the Dupuy & Berberian books were not formatted this way? Those are fine books, but would seem to me to be working aesthetic terrain that's not actually been a rich one for North American comics. How have those books done for you? OLIVEROS: Working with the European artists is interesting, as they are very used to the standard imprint format of most French companies. When you present them with possibilities of design, most are pretty delighted to have a hardcover. I believe originally, Dupuy & Berberian wanted a die-cut on a jacket; the jacket stayed but the die-cut was nixed somewhere in the process. North Americans do tend to like their comics to be both serious and/or a memoir, which did make introducing Dupuy & Berberian unusual. But once you put their books in the hands of readers, people love their comic sensibility. 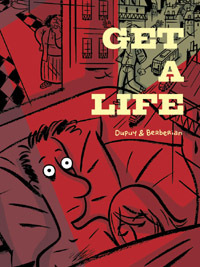 Get a Life and Maybe Later received great press from Entertainment Weekly to the Onion, and they were even invited to be special guests at the prestigious IFOA in Toronto, where they landed in all three Toronto newspapers. Their sales are on target for first time authors whose books don't have the timeliness sales-hook of a Pyongyang or the anthology-driven recognition of a Kevin Huizenga. SPURGEON: You're two books into Walt & Skeezix; is there anything that's surprised you about the reaction to that work? For instance, I've seen more people reacting to the emotional undercurrent in the work than I thought I would otherwise. OLIVEROS: Part of what makes the Walt & Skeezix books so unique is that it's the first series of its kind to feature a comprehensive documentation of the creator's life, placing this within the context of his actual work. With Frank King in particular, the connection between his life and art is profound, and it places the work itself in a new light. 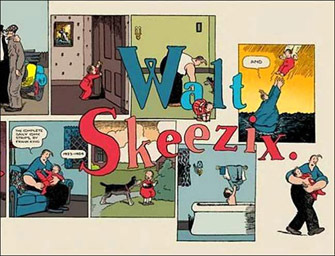 One aspect of the reaction that I was pleasantly surprised by, was that most reviewers were charmed and won over by the father/son relationship of Skeezix and Walt. The relationship still resonates, which of course is why the strip has run for as long as it has. There are so many things to say about King -- he was the first cartoonist to age his characters in real time, to have a realistic storyline, his design and color sense are impeccable -- but it was great to see readers just zero in on the heart of the strip. SPURGEON: Are you selling a greater percentage of your books in the book market versus the direct market than you were last year? 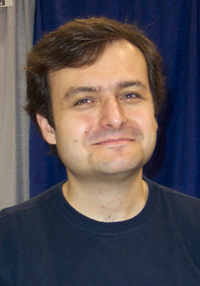 OLIVEROS: I hear a lot about comic retailers ordering through the book market. I know that stores like DreamHaven and Quimby's order straight from our FSG rep, while there are probably countless comic shops that order from Baker & Taylor. So the lines are blurred. But yes, compared to ten years ago, most of our books go out through the book market. I would estimate that 1/4-1/3 of each title is sold through direct market venues, the rest being the book market. However, I still view the direct market as being essential and valuable to the continued growth of comics. 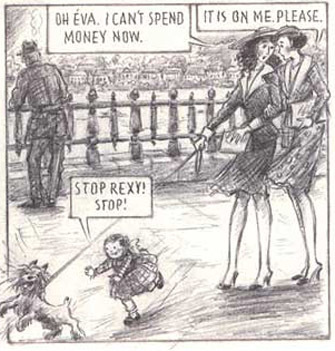 There are still a number of stores like Jim Hanley's, Comic Relief, Chicago Comics, the Beguiling, Rocketship and so on who can be counted on to have the best and most informed selections of comics and graphic novels -- something that is still uneven in many book chains. SPURGEON: Other than Adrian Tomine's and Joe Matt's very successful comic books, how much of an emphasis will there be on comic book in D+Q's future? Is Sammy's book going to continue? Are you looking for more comic book-type projects to do? What are the advantages as you see it to having a serialized work out there, or is it more about what the artist wishes to do? OLIVEROS: We tend to explain to artists now about the pros and cons of doing a comic book series, which sadly are mostly cons. Ultimately, however, it is up to the cartoonist to create their story as they see fit. We do not want to dictate their creative process. So you can explain to them that comics do not sell, original graphic novels sell very well, and that with an advance, the payoff is better to wait, but if they want to see their story serialized, then what can you do. The input from peers and fans that some authors receive from a comic book series is invaluable to them. 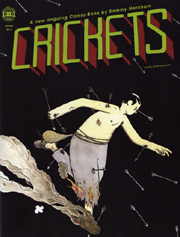 That said, we are still doing Crickets by Sammy Harkham, and we are going to begin a series by Gabrielle Bell. 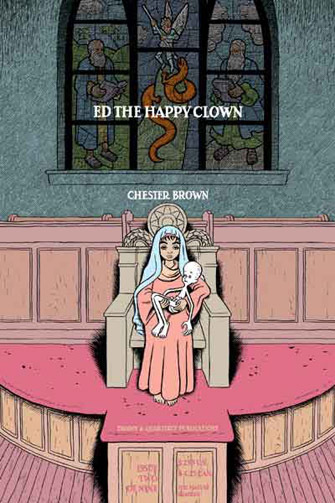 But we also have many authors working on books that won't be serialized, such as Chester Brown's next project and a new book from Vanessa Davis. SPURGEON: Do you see yourself doing any more projects like the re-serialization of Ed the Happy Clown? OLIVEROS: No, that was a one-time project. SPURGEON: Is there an artist that has participated in your Showcase series that you think made specific use of that opportunity? I'm not asking you to punk on anyone else, but is there a model now for how you'd like to see that book work? OLIVEROS: I think our latest volume with Dan Zettwoch, Gabrielle Bell and Martin Cendreda was a great example of the three artists using the 30-pages with color to the fullest potential. I think each volume featured some outstanding work; other stories that come to mind are Sammy Harkham's and Genevieve Elverum's (from volume 3), and of course Kevin Huizenga's from the first volume (which has just been collected in Curses). SPURGEON: We talked about the design, but what was the experience like of working with Miriam Katin on her book overall? It seems like Katin's book kind of goes back to what I remember about an element of D+Q at its beginning, affording people with a sophisticated approach to visual work a chance to work in comics, to tell a story. Have the sales in general matched the critical reaction there? OLIVEROS: I am proud that we published a viewpoint that is seldom if ever heard in the comic format, that of being a 63-year-old woman and her story of survival. I came across Miriam's work as a submission and was immediately entranced by the beauty of her drawing. She created a piece for our anthology and I asked if she wanted to do a book. I heard a stat that general mid-list prose books by first time authors sell 3,000-5,000 copies, so we shipped 9,000 copies of Miriam's book, saw some returns and are more than pleased with her debut. I am confident that We Are On Our Own will be a perennial title as it will be adopted and included on best of lists, as it reaches an audience that may not normally read comics. It is a title that you can give a reader of any age, who may not normally read comics, and they immediately understand the enormous range of what stories comics can tell. SPURGEON: Can I ask how much you guys worked with Chris Ware on the latest ACME? I can't remember off the top of my head if you'd be doing any work on the book or if you were just facilitating Chris's relationship with your distributor. OLIVEROS: On the Acme series, we are Chris Ware's distributor. For the Acme Datebook series (his collected sketchbooks) we are the publisher. SPURGEON: So you're continuing with the ACME Datebook series, then? When is the next book planned? OLIVEROS: Yes, we are publishing the Acme Novelty Datebook in Fall 2007. SPURGEON: There's been a wave of Canadian comics awareness lately, with awards, more prominent festivals, web sites and even a new book out. Where do you think D+Q stands in Canadian comics history? the world (among them Seth, Chester Brown, Julie Doucet, Guy Delisle, and Michel Rabagliati). We also will soon publish the work of some important Canadian artists of the past, including Laurence Hyde (a facsimile hardcover of his 1951 woodcut novel, Southern Cross), Doug Wright (a planned two-volume retrospective series designed and edited by Seth), and Albert Chartier (a new edition of his comics from the 1950s/60s). SPURGEON: What's 2007 look like generally? Is there any offbeat or special project from D&Q due in 2007 that you'd like to mention, maybe something not so much from one of the big names? OLIVEROS: 2007 will be another watershed year for D+Q. We have so many projects by new authors like Rutu Modan and Marguerite Abouet, but we also have huge titles coming from our core D+Q authors like Joe Matt, Julie Doucet, and Adrian Tomine (whose Fall 2007 book, Shortcomings, will have our largest first printing of a book, 25,000 copies). We will also be making an exciting announcement in January about a new multi-book contract with a legendary cartoonist. 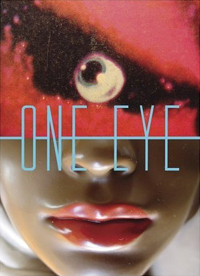 In January we'll also publish a new book by Charles Burns, One Eye, which will likely surprise some Burns' fans because it is a complete departure from anything he's done before (it's a photography book). SPURGEON: Do you have anything planned for the holidays? OLIVEROS: All of our 2006 books have shipped and have been in stores for the last month or so, which is a gift in itself! We will be having a small office party this week and next week the office will be closed and the staff will be with their families. No packing boxes, invoicing, etc., allowed. Happy holidays!